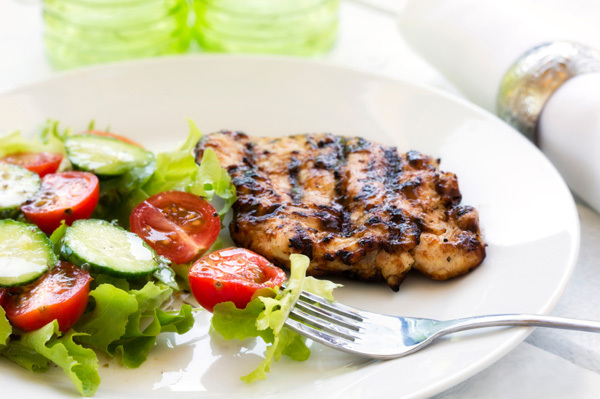 Vanilla and balsamic are two things you don’t usually see together, but turning them into a marinade makes a plain chicken breast extra special. Vanilla and balsamic are two of my favorite flavors. Vanilla is great in cookies, cakes and ice cream and balsamic vinegar always turns a salad or bruschetta into a wonderful appetizer or side. But I’d never thought about putting those two flavors together, let alone together for a marinade for chicken. My Recipes wasn’t so narrow minded. They knew that those two flavors would sing when put together and turn a plain old chicken breast into something special. I’m so glad I trusted them because instead of a standard salted piece of chicken, I got to eat something sweet and didn’t have to wait for dessert. Laid over some couscous, my family got a dinner that was truly special. Combine the chicken broth, balsamic, shallots, sugar, seeds from the vanilla bean, orange zest and orange juice in a medium saucepan over medium-high heat and bring to a boil.